Xiaomi has finally launched its new gaming smartphone under the Black Shark brand, and it is a phone that is going to compete with the rumored Razer Phone 2 and the upcoming gaming smartphone from Nubia. It is not a just another high-end phone with Snapdragon 845 but rather an interesting one that packs a unique design, solid internal hardware (like cooling system) and more. In this article, let’s have a look at the main highlights of the Black Shark Gaming smartphone. It seems Green is a color that we are going to see on almost every upcoming smartphone aimed at gaming. The Razer phone had green accent color and so does the phone from Black Shark. For a better grip, the rear panel has an X-shape, and this X-shaped rear panel also houses the Antenna. From the rear, the design is similar to a rugged phone made for extreme weather conditions. The volume rockers are present on the right side along with the power button, but there is another key on the left that lets the user use the hardware (processor, GPU, etc.) at its full potential for a better gaming experience. There is a dual camera setup on the rear placed on the top with LED flash. On the front, the phone has an 18:9 panel and the fingerprint scanner is also located on the front that also acts as a home button. There aren’t stereo front-firing speakers like Razer phone. The Black Shark Gaming Smartphone has a single speaker on the bottom, but the earpiece acts as a secondary speaker and provides Biso stereo sound. There is no headphone jack, and so, only a USB Type-C port is there on the bottom side. 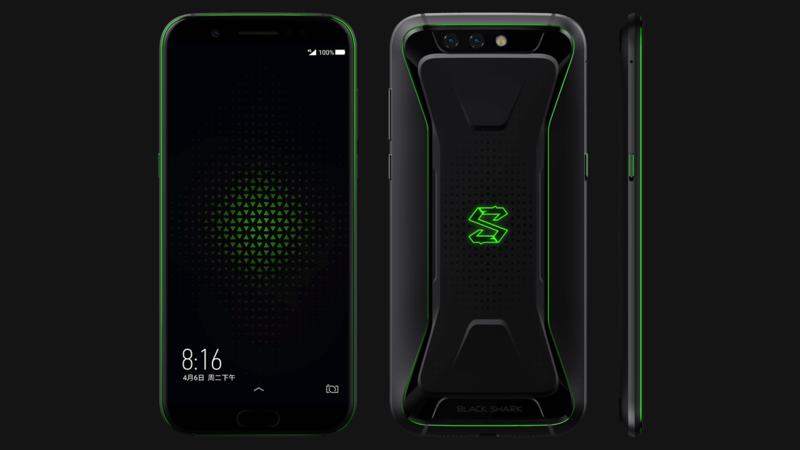 Now coming to the specifications, the Black Shark Gaming Smartphone has a 5.99-inch 18:9 Full-HD+ display with 97% DCI-P3 Color Gamut. The screen has up to 550 nits of brightness. Powering this beast is the latest 2.8GHz Snapdragon 845 processor with Adreno 630 GPU, 6/8GB RAM, and 64/128GB internal storage. There is no microSD card slot. A 4,000mAh battery is there with the Fast Charging 3.0 support with USB Type-C port. On the rear, there are dual cameras including the main 12MP sensor with a f/1.75 aperture and 1.25 µm pixel site. The secondary camera is a 12MP lens having the same f/1.75 aperture and 1.0µm pixel size. The rear camera has features like PDAF, Portrait Mode, Low Light enhancement, etc. On the front, the phone has a 20MP camera with f/2.2 aperture. The Black Shark gaming smartphone has a unique liquid cooling system inside that helps in lowering the CPU temperature up to 8-degrees. With the phone, the company has also launched a gamepad that can be attached like the Nintendo switch. The gamepad can connect via Bluetooth and has its 340mAh battery. The first 50,000 buyers of the phone will be able to get it free of cost. Finally, talking about the pricing, the Black Shark Gaming smartphone is available in two colors – Night Black and Sky Gray. The 6GB RAM + 64GB ROM variant is priced at CNY 2,999 or $477 while the 8GB RAM + 128GB ROM variant is priced at CNY 3,499 or $557. The gamepad, on the other hand, is priced at CNY 179 or $29. The pre-orders have started on JD.com.